An analysis of DNA spanning 5,500 years shows we’ve been wrong about the origin of domesticated horses, and the common notion that wild horses still exist is completely wrong. The oldest archaeological evidence of horse domestication dates back 5,500 years ago, to the ancient Botai people who once lived in what is now northern Kazakhstan. Understandably, scientists assumed this was the place and time where domesticated equines first emerged, but new research published today in Science is overturning this long held assumption. Modern domesticated horses, it now appears, are not descended from the Botai horses, and the identity of their true ancestral population is now a mystery to be solved. The new study, led by Sandra Olsen from the University of Kansas and Ludovic Orlando from the National Center for Scientific Research (CNRS) in Toulouse, France, also yielded a second major finding. 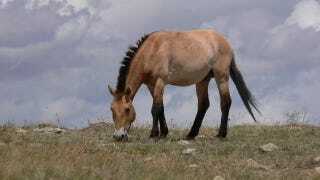 The Przewalski’s horse (pronounced “peh-je-vahl-skee”), a living population of “wild” horses native to the Eurasian steppes, are descended from the Botai horses. Przewalski’s horses, therefore, come from domesticated stock—albeit domesticated stock that existed some 5,500 years ago. So technically speaking they’re not “wild” horses—they’re actually feral horses. And because other living free-roaming horses, such as the mustang of North America and the brumby of Australia, also come from domesticated stock, they’re not truly “wild” either. In fact, no horse alive today is untouched by human domestication. To Olsen, both findings came a big surprise. Fifty years ago, the Przewalski’s horse was declared extinct in the wild. Those living today, all 2,000 of them, were bred from just 15 individuals captured around 1900. A conservation program has re-introduced these horses to the Eurasian steppes, and are rebounding quite nicely. To reach this conclusion, Olsen’s team analyzed the genomes of 42 ancient and modern horses, including DNA from 22 horses from across Eurasia (these gene samples were taken from a wide range of historical eras and geographical locations across Eurasia), and 20 Botai horses whose remains were pulled from the Botai and Krasny Yar archaeological digs in Kazakhstan. Collectively, these samples were used for a phylogenetic analysis, that is, the construction of a genetic “family” tree for horses. When comparing these ancient and modern genomes, the researchers were unable to link domesticated horses back to the Botai horses—except for the Przewalski’s horse. “Earliest herded horses [i.e. the Botai horses] were the ancestors of feral Przewalski’s horses but not of modern domesticates,” write the authors in the new study. The authors speculate that sometime around 3,000 BC, a different population of horses became the source of all modern domesticated sources. “Future work must focus on identifying the main source of the domestic horse stock and investigating how the multiple human cultures managed the available genetic variation to forge the many horse types known in history,” write the authors. Carles Lalueza Fox, a research scientist working at Spain’s Institut de Biologia Evolutiva who wasn’t involved in the new study, says the new paper clarifies the status of Przewalski horses, which were supposedly the last wild horses on Earth. He says the new paper also presents some new areas of inquiry. Lalueza Fox theorizes that the undiscovered population of horses might be linked to the huge population turnovers that happened in Western Eurasia during the Bronze Age, which began in the mid 4th millennium BC. So we’ve got some clues—now it’s just a matter of finding the genetic and archaeological evidence.